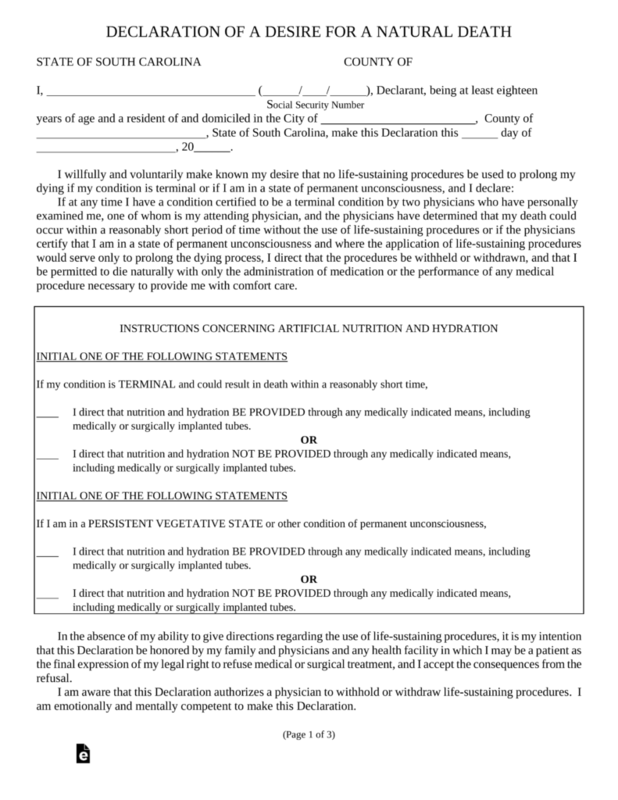 The South Carolina living will form is a legal document that allows a Declarant/Principal to voluntarily and willingly make their own desires known, that there should be no life-sustaining procedures that should be used to prolong the death of the Declarant if in fact, their condition is terminal or if it happens that they are in a state of permanent unconsciousness. 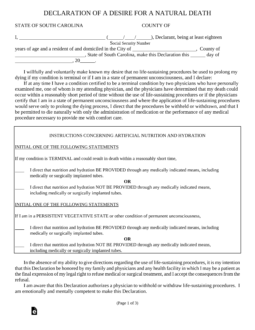 If at any time the declarant’s condition is certified to be a terminal by two physicians who have thoroughly examined the declarant one of which is the attending physician of the declarant, and should it be the first and second of opinon physicians agree that my death could occur within a reasonably short period of time without the use of life-sustaining procedures then the declarant’s end of life desires should be honored. This document may be revoked at any time as long as the declarant is competent to do so. Medical Power of Attorney – Use to create a relationship with someone else to represent your best interests in association with health care needs if the patient cannot make them. Step 3 –Instructions Concerning Artificial Nutrition and Hydration – In the box provided, there will be selections that the declarant must make with regard to their options for their end of life treatments. Step 4 – Selection of Agent – Unlike most Agents, you may choose an agent that may not only assist with honoring your end of life wishes, but the agent, if you so desire, may also revoke this document if they feel that your desires are not being met appropriately. Step 6 – Notarization – Once the Notary Public has witnessed all signatures, the notary will proceed to complete the document as required by law, authenticating the document and signatures by affixing the state seal to the document.